“Décortiquer” means “to peel, to hull, to dissect”. 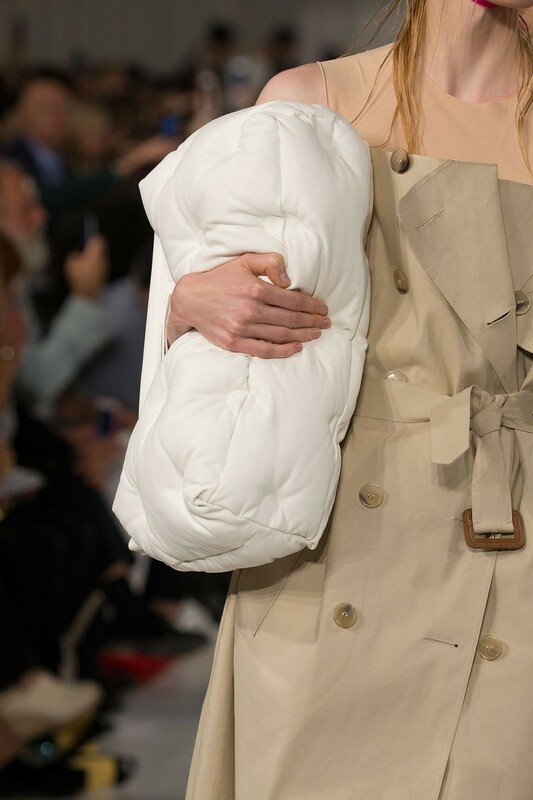 It’s the term John Galliano has alighted on to describe his approach to Maison Margiela; he applies it to a technique, to the stripping back of a garment to the bare necessities. Necessary here means the flaps and flanges and frames of fabric that actually hold one another together, forming something that can be worn as opposed to a pretty pile of ribbons. You wind up with a cagey version of a T-shirt or jacket or trench coat, layered over something more substantial. It renders the utilitarian and plebeian decorative; it’s an act of transformation via removal. How terribly clever, and how very Margiela. 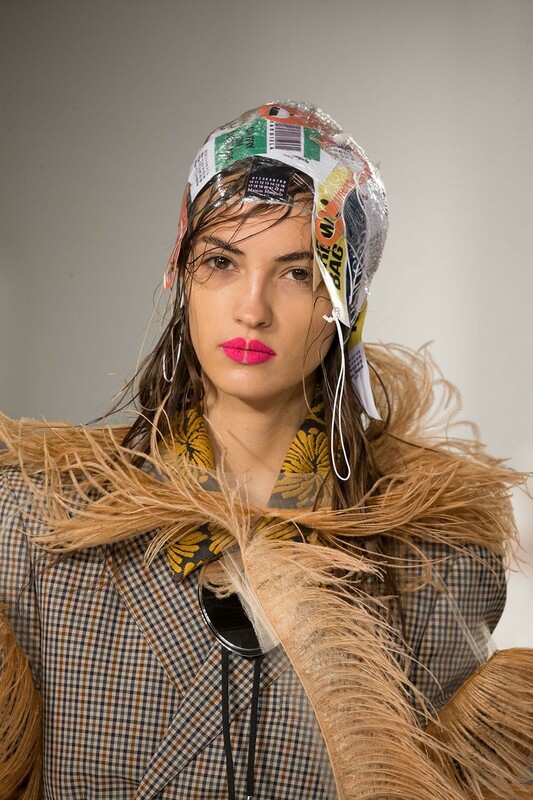 The most interesting thing about John Galliano’s three year creative arc at Maison Margiela is how rapidly he has not only absorbed the aesthetic identity of the label, but has reinvented it as his own. 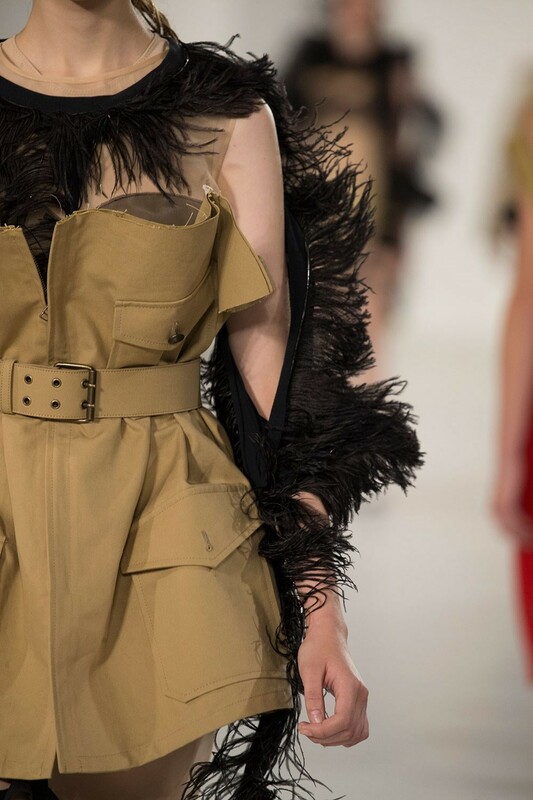 I say reinvented rather than invented, because Galliano is actually pulling from Margiela’s archive – it’s just often not the stuff we’re overwhelmingly familiar with. If there is a shared ethos between Galliano and Margiela, it is that – the full-on. So while you may find a certain visual similarity between Margiela’s make-do-and-mend ethos and Galliano early 80s topsy-turvy collections – where trousers became jackets and blazers skirts in a higgledy-piggledy childlike mishmash of clothing – or between Galliano’s historicism and Margiela’s rampant recycling, it’s the spirit thats most alike. Margiela under Galliano doesn’t look like Margiela under Margiela: it shouldn’t. It’s been reinvented. It’s a different house now. 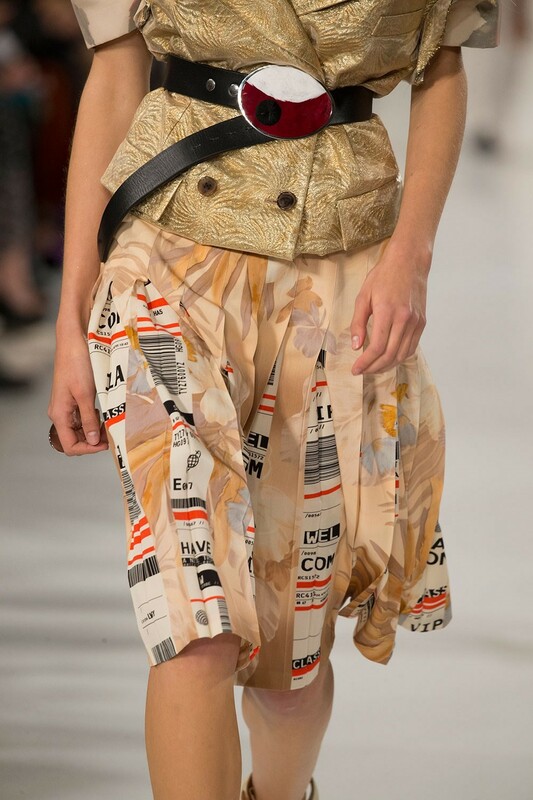 Let’s pull ourselves back to the present – what did Galliano show for spring? A collection oddly inspired by haste in dressing, reflecting the hectic contemporary world of perpetual travel – for business, or for pleasure, always in the departures lounge, always disembarking. Galliano’s focus on ordinary clothes acutely reflects that; T-shirts and jogging-suits and easily wrapped coats are what people travel in, rather than retrograde nipped and tucked suits or high heels. Then again, there were references to those too – to archetypes of preened dressing, like slithery chiffon dresses punctuated with pleats like a cross between an homage and parody of Monroe and her Seven Year Itch look. 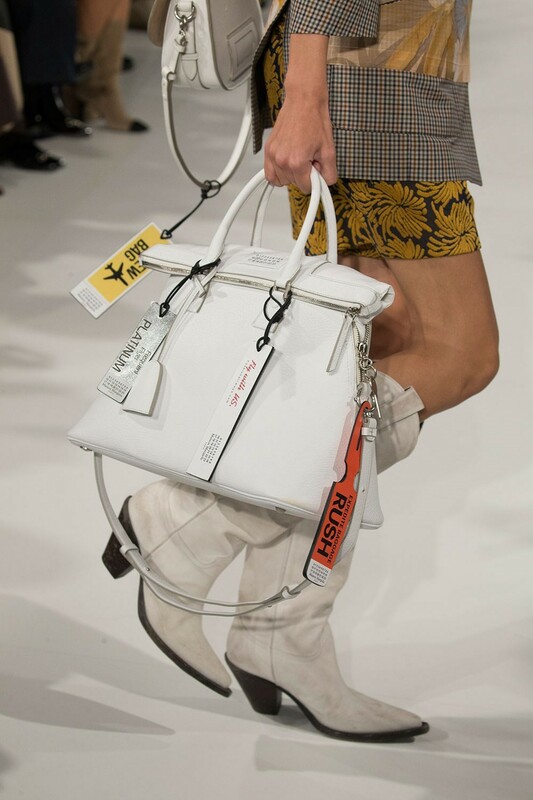 There were ripped-up trench coats, underwear shovelled on as outwear, and leather luggage tags as unconventional (or even unhinged) accessories. Bags looked like fluffy clouds, as glimpsed outside of an aeroplane window. There was a lot going on. Most of it had holes cut in. Nevertheless, amongst the madness, one notion was reiterated again and again – the word, and the tropes, of ‘glamour’. 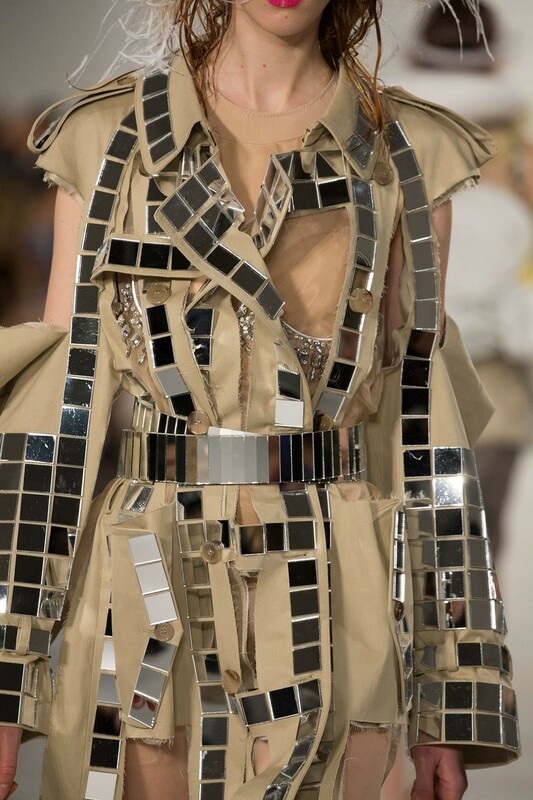 “We set out to propose and further explore the idea of a new glamour that seduces us in our everyday lives,” was the statement credited to the collective Margiela maison, that nevertheless bore the definitive hallmark of Galliano’s piquant wit. As did the clothes, where that glamour manifested itself as ostrich feather trims sprouting like weeds from those decortiqué T-shirt frames. They looked like a cross between Meret Oppenheim surrealist constructions, and glam rock boas. Which are two opposing territories Galliano’s Margiela happily straddles. Don’t let Galliano fool you: glamour was never Margiela’s bag. His bag, indeed, was plastic, from a French grocery, worn as a blouse with a long evening skirt. Galliano adores glamour, but he seems especially interested in exploring it through the prism of Margiela, the quintessentially anti-glamorous designer. Perhaps that is what makes Galliano’s work at Margiela so compelling, so endlessly innovative – not the many similarities, but the many difference, between these two great designers whose work both has and continues to define the way people dress in the 21st century. Despite first impressions, there’s always plenty here to wear. Just peel back the layers.